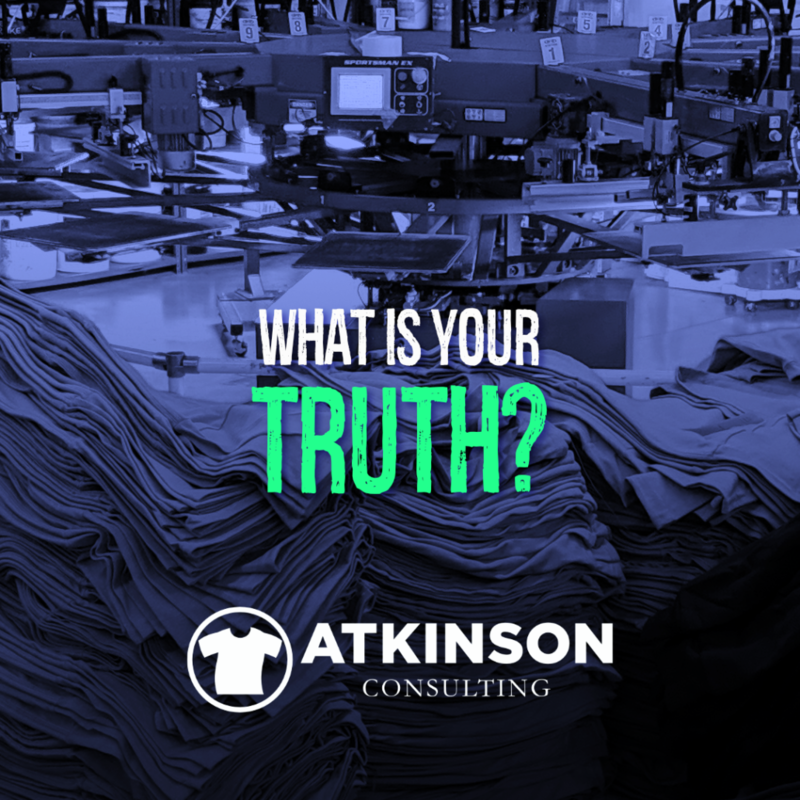 One question for you about your business…what is your truth? Not what you tell yourself or hope to be. Lately, I’ve been coming across many businesses in the decorated apparel industry that, ahem, are simply all over the place with their idea of what they want to be when they grow up. At the heart of their business isn’t an alignment with what their customers want or crave. Instead, they push and push and push…but in directions that don’t make sense for them. Your customers define who you are, not the other way around. For your business, your ultimate truth is defined by the people that buy from you. So what happens when the truth you are selling doesn’t match what the truth your customer believes? When you don’t believe in the value you bring, out comes the machete to the prices. It’s willing to lop something off to close that sale. That something is called profit. Have you ever watched a salesperson try to close a deal when they don’t believe in the product they are shilling? They fumble around and nervously spit out nonsense that nobody believes. It’s a verbal death spiral to any deal that might have been on the table. Is that why you lowball your work? You don’t believe that you are worth more? That you bring more value. More creativity. Knowledge. Expertise. Heat. Everyone knows that the closer to free that you get with your pricing the easier it is to get people to buy into what you are selling. Which means that not only are you scared to ask for more, but there is a certain amount of laziness built in too. Out on the production floor right now I’ll bet there are one or two jobs (hopefully not more) that you are somewhat upside down on in price. You are losing money on them before you even get them set up. Hopefully, there aren’t any production mistakes! It is dressed like work and not fun. Therefore the truth in your shop is that you don’t know the real costs. Hello. Your margins are about more than how much you mark up the cost of the shirt blank. This is that ten color job for thirteen shirts. That 128,000 stitch one off embroidery job you are doing for $20. Those Dollar Store bargain rack customer supplied shirts that your customer dropped off in a garbage bag and you spent an hour sorting through them. Have you done an autopsy on the year yet? Yes, I know you are trying to get Q1 going. Everyone is pretty much dead in the water right now. The sooner we can get some sales in the better. However, what happened last year? Or the year before that? Go back five years even. Can you chart your rollercoaster ride? What is your real sales truth? Look both in top line sales and the amount of work (impressions) that you booked. Do you see year over year growth? The best shops in this business are planning their sales six to eight weeks out. Which means that the January slump you are in for them was filled way back before Thanksgiving. Or even sooner, as they have found other markets to target that make more stable business sense than the one you are deadset on marketing to. Hint: It’s 100% ok to explore new markets. So, if you are game to dig into your metrics try this on for size. In this example, the bottom 80% of the customers account for $394,000 and are customers 19-100 in the ranking. The top 20% of sales are controlled by 18 customers…and they account for $1,606,000. That’s right. Eighteen customers account for $1,606,000 worth of $2,000,000 sales. It’s crucial that you identify your top 20%. That is your truth. This is who spends the best money with you. These are your best customers. If you aren’t a $2,000,000 shop just take off a zero to the numbers on the example list. I’ll bet they might come close to your top 20%. 80/20 won’t line up exact…but it will be damn close. Which means that in my example the $600,000 a year customer becomes a $60,000 a year one for a $200,000 a year shop. The relationship is the same. So while it’s tempting to spend a lot of time grinding gears fussing over that six-piece order that some walk-in customer “just had to have now”, they aren’t doing you any favors. Want to make a difference in 2019? Worry more about this top 20% than the bottom 80%. These folks need to be seriously, deliriously happy. In fact, if you are doing this right they are your biggest advocates and referrals. Sales and marketing are much easier when your customers do half the work. So after you read this article, log into your system and pull the data. Identify the top 20%. That’s the truth of your business. Now that you know that, your job in sales and marketing is to seek out more customers just like these. If you want to learn how to price your shop using your own costs and efficiency, get my Price for Profit eBook. If you have been using the “average pricing of all the shops around me method”, you may be failing to make the money you want. Learn to do it the right way. “The goal of education is the advancement of knowledge and the dissemination of truth.” – John F. Kennedy. Want Advanced Sales & Marketing Help? At one point in your career, you took a workshop to learn how to coat a screen or pull a squeegee. But have you ever learned how to sell? How to close a deal? Market your company with modern tools? That’s what Shirt Lab is all about. We want to give you hands-on sales and marketing training that will push your shop to the next level. Need some better tools and knowledge? Let Shirt Lab help.